Spooky was also seen named Spook which only had third generation hang tags. Both versions were designed by Jenna Boldebuck. Spooky is the only Beanie Baby with a designers name on the tag! Jenna was the daughter of Ty Warners current girlfriend. And they were the first non animal beanies! Spooks mouth is glued on and has been known to fall off! Spooky's mouth has been seen stitched on as a V shape and a U shape, though sometimes it is something in the middle of those! The best friend that Spooky can be! Early edition of Spooky the ghost were just named "Spook". NOTE: This version of Spook must contain the "Designed by Jenna Boldebuck" line on the inside of the hang tag. This was the only Beanie Baby to have a "Designed by" line on its tag! While he has never married, Warner is sometimes said to live in a relatively humble home in Oakbrook, Illinois with long-term girl-friend and former lighting designer Faith McGowen and her daughters Jenna and Lauren Boldebuck until they attended college. Lauren attends the University of Iowa. All three have had some involvement with Ty Inc., designing Beanies. He also owns a lavish home in Santa Barbara California where Forbes says he spent $27 million purchasing some adjacent land. An authenticated Spook the ghost Beanie Baby sold on Smart Collecting Auctions at Collecting Nation on October 18th for $240. This was an InstaBid auction in which the first bidder instantly wins the auction. The Beanie had a slightly creased 3rd generation heart tag and a mint 1st generation tush tag. Becky Estenssoro had authenticated the Beanie Baby. The seller, known as "JennyBean" on Collecting Nation had a feedback rating with 852 positive comments. 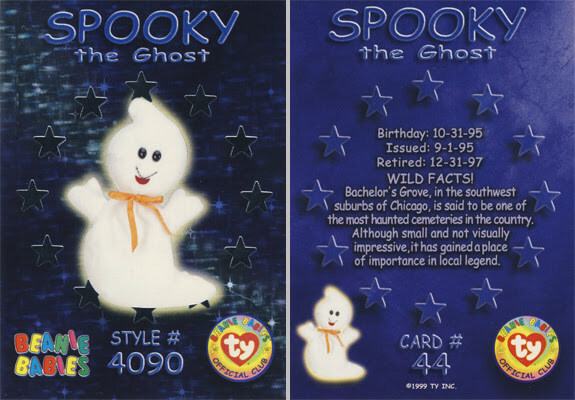 Spook the ghost was issued on September 1, 1995. Later that year, its name was changed to Spooky, which retired on December 31, 1997. Spook was only produced with a 3rd generation heart tag. According to Checkerbee's Summer 2000 Value Guide for Ty Beanie Babies, a Spook the ghost Beanie Baby with a mint 3rd generation heart tag is valued at $455. This little white ghost was introduced in September 1995. Early in production there was an error made to result in Spooky™ Being Spook. His "tush tag" Is located under his left arm unlike Spooky™ where the tag is on his tail. There is also a variation of Spooky™ in the way that his mouth was sewn on, some have the black thread with a slight smile, a U smile, and V Smile, and on some, the black thread is just plain missing.